James “Jim” D. Sousek, Sr.
Saturday, January 26, 2019 ~ 10:00 a.m.
James “Jim” D. Sousek, Sr., 93 of Wahoo, NE entered into eternal rest Wednesday, January 16, 2019 at South Haven Living Center in Wahoo. He was born August 20, 1925 on a farm southwest of Prague, NE to Frank and Anna (Vanek) Sousek. 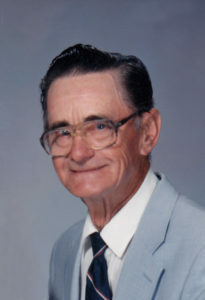 He attended District #84 grade school near his home and graduated from Prague High School in 1943. Jim served his country during WWII in the Army as a Corporal and was stationed in France, Belgium and Germany. He was awarded the Bronze Star Medal, Good Conduct Medal and the Expert Rifleman Badge. He was honorably discharged on February 6, 1946. On August 31, 1948 he was united in marriage to Charlotte Stuchlik at St. John Nepomucene Catholic Church in Weston, NE. Jim was a lifelong farmer, a devoted husband, caring father, grandfather and great-grandfather. He was able to speak, write and read the Czech language. He enjoyed dancing to Czech music and at the age of seven, his father taught him how to play the accordion and Jim played all his life at care centers and Veteran Hospitals. As a hobby Jim made rugs on a loom for 25 years. He was a former member of Sts. Cyril & Methodius Catholic Church at Plasi, current member of St. Wenceslaus Catholic Church, American Legion #232, Saunders County Czechs, former President and Charter member of Nebraska Czech Inc. and the Pork Producers. He was preceded in death by his wife, Charlotte Sousek; parents, Frank and Anna Sousek; grandson, Joseph Slechta; siblings, Stanley Sousek, Victor Sousek, Anne Divis and Joe Sousek. Condolences for James “Jim” D. Sousek, Sr. Sister Cecilia Ann Rezac, M.S. Praying for all of you! Uncle Jim always had a smile on his face, a prayer in his heart, and a bit of polka music in all that he did. 🙂 May God grant him eternal rest and a wonderful reunion with those loved ones who have gone before him. So sorry to read of Jim’s passing. I will always remember his smiling face. Even though he’s gone from our sight, they never leave our hearts. Prayers for a peaceful heart at this difficult time.